The Estate Access Management (EAM) project viewer (dated August 7th) is a new project viewer to enhance – as the name implies – the estate access management tools available to region holders and their estate managers within the viewer. 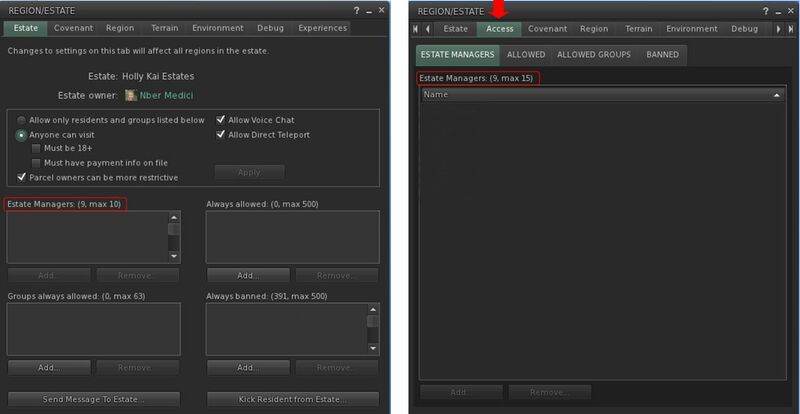 New viewer UI for displaying Estate Managers, allowed groups and allowed / banned individuals within a region. New capabilities for sorting / searching lists. Additional information recorded and displayed for banned accounts. Number of Estate Managers increased from 10 to 15. Under the current viewer, the lists for managing Estate Managers, allowed groups and allowed or banned avatars in a region / estate have been crammed into the first tab of the Region / Estate floater (World > Region / Estate). This has made management of the lists difficult, given only around 5 names can be displayed by each – which can be problematic when the Banned list allows up to 500 names. In addition, lists cannot be searched and, again in the case of the Banned list, no other information is provided against a banned name, making it hard to determine whether or not a ban might actually be rescinded, thus helping with general list management. As such, there have been long-standing requests for the estate access controls to be improved. The Estate Access Management project attempts to address these issues by introducing both back-end changes in support of managing ban lists and by revising how the various lists themselves are displayed within the viewer and how they can be used. In particular, the EAM project viewer introduces a new Access tab in the Region / Estate floater (World > Region / Estate). This tab in turn has individual tabs for managing the lists for Estate Managers, Allowed avatars, Allowed Groups and Banned avatars. In terms of adding or removing names and groups, the new sub-tabs work exactly as the lists in the current viewer work. The last date on which a banned individual logged-in to Second Life (to assist with housekeeping the list – if an account hasn’t been used in X months or years, why keep it on the list?). The date on which an individual was banned. The name of the EM / region holder banning them. Note this information will be displayed by the EAM viewer for all accounts going forward – even those banned using other viewers, reflecting a change to the back-end database for managing bans. Banned accounts existing at the time the EAM updates were introduced will simply have “n/a” recorded for each of these fields. The Banned tab can be sorted into ascending / descending order by banned name, date last logged in, date banned, or by person banning them. Click on the column title to sort. 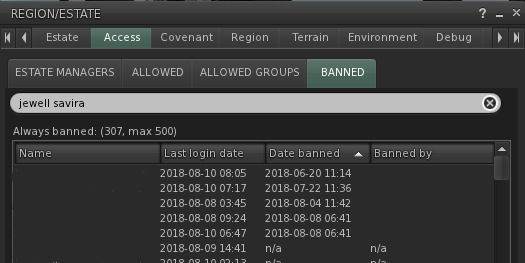 The Banned List includes columns for date of last log-in, date banned, and region holder / EM who banned them. These columns can also be sorted into ascending or descending order by clicking on the field title, as can the account name column. The Estate Managers, Allowed and Allowed Groups tabs can be sorted into ascending / descending order by name. Click on the column title to sort. The Allowed Groups, Allowed and Banned tabs all include a search option. The number of allowed Estate Managers is increased from 10 EMs to 15 EMs – again in response to many requests from region holders. The Lab is keen to have feedback on these new tabs and the improvements made to handling estate access control. If you are a region holder with EM rights, or an Estate Manager, please consider downloading this project viewer and giving it a try. Any issues should be reported via the Second Life JIRA, using the [EAM] project reference in the title. Note: names intentionally removed from fields and columns in the images used in this article.